Oddly my wife seems to believe that you can have too many recipe books. At New Year 200 9 she challenged me to make at least one dish that I hadn’t made before from every one of the books that I’ve picked up here and there over the years. I’m not really sure how many that is but I’m sure it’s more than 200. Fourteen months later, I’ve managed 51, which is pretty poor, but I’m easily distracted. During those 14 months I’ve only added half a dozen or so books to the collection and oddest among these additions is a copy of the Constance Spry Cookery Book that my father-in-law gave me. This book was published in the 1950s and comes from an alien world of shooting party luncheons, gills and yard men in country houses. It’s strangely refreshing to see food considered from such a different viewpoint. One of the recipes in the book that particularly interested me is from a village baker in Savennières in the Loire valley. I didn’t really fancy making it the authentic Constance Spry way and so I’ve adapted it (fairly heavily) for the bread maker. This is certainly not authentic but it makes a very pleasing, not overly rich brioche that slices easily and toasts well (if rapidly) the following day. I think it would also make a very good bread and butter pudding, but I’ve not tried. I flavoured this with orange zest because I wanted to eat it with marmalade, but vanilla would be great as well. Place the ingredients into the bread maker bucket in the order given if you have a bread maker that adds flour first (notably the rather excellent Panasonic range) or reverse the order if the bread maker normally adds liquid first. Start the machine using the basic dough programme. Take a largish baking sheet and either grease it well or cover with a silicone sheet. Once the programme has finished, press the dough out onto the baking sheet in as neat a circle as you reasonably can without overworking it. You should end up with a circle about the size of a dinner plate with dough about 2.5cm thick. Place it somewhere warm for 30 minutes, uncovered. Preheat the oven to 180°C (for a fan oven, a bit hotter otherwise). Make a criss-cross pattern on top of the dough with lines around 5cm apart using the back of a long knife. Bake in the preheated oven for 15 minutes. Take the bread out of the oven and quickly, but thoroughly, paint the top with the beaten egg in order to create the glaze. Put the bread back in the oven and bake for another 5 minutes. After this time, it should be glossy on top and sound hollow when tapped on the base. Cool on wire rack and serve sliced with butter and marmalade or honey. Duck can be expensive, but the legs seem to be the best value bit. I’ve been told that duck sauces should be served with tagliatelle and, since I don’t want to argue with an Italian, I couldn’t agree more. 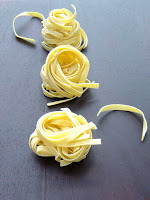 (Although I’m sure that a different pasta of the same general type and shape might do instead). Season the duck legs all over and roast at 180°C (in a fan oven, a little hotter otherwise) for 50 minutes. Set them aside until they are cool enough to handle, remove the skin and strip all the meat from the bones, getting rid of as much fat as reasonably possible as you go. Hopefully you should be left with small but irregular bits of meat. In the meantime, heat a little olive oil and fry the shallots and carrots gently for 7 or 8 minutes. Add the garlic and continue to fry for another 2 minutes. Turn up the heat, add the red wine and reduce it until its almost gone. Lower the heat, add the tomatoes, the sugar and oregano. Season with salt and pepper and simmer the mixture gently for 10 to 15 minutes until it has thickened a little. Add the duck meat and heat through before serving with your chosen pasta.